Last year, I chatted about "night folk" artist Shura on BBC 6Music, now on Akira Records. Well, the guys behind that label, are also in a "dream folk" band. 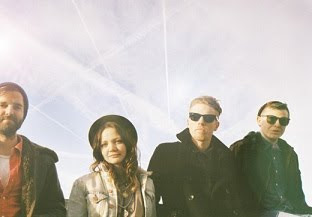 That band used to be called Solar State but they've started afresh name-wise, with Mt. Wolf. And unleashed one of the most hypnotic tracks of the year in 'Life Size Ghosts'. There's another track available to listen in the form of the heavily dubstep-influenced 'Underground', which combines pulsating beats and acoustic folk before diving into a shimmering sea of ambience. It's certainly an interesting offering. But it's 'Life Size Ghosts' where the dream folk tag comes into play, with its incredible ethereal vocals - think Wild Beasts meets the aforementioned Shura. Find more info on the band at Facebook.